Introduction: One of the downfalls of being such an avid collector of tackle is figuring which combinations you want to bring on each trip, and how you're going to pack them in the boat. Here at TackleTour, the decision making process is further complicated by our dynamic list of items to test and review. You can bet, when we received our two new Team TackleTour bass boats this year, the first thing we did was to sit down and discuss our rod storage requirements. 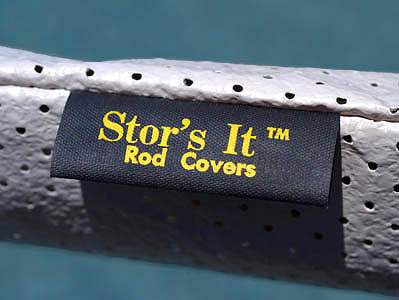 One of the solutions that materialized was a system of rod covers offered by a company named Stor's It. Impressions: Anyone who has owned a bass boat whether large or small knows that the challenges involved in rod storage. Equipped with lockers of varying configurations, one thing that is common within these rod lockers is bent guides, broken tips, and quite often a tangled mess. Rod racks minimize many of these issues but they greatly limit the number of combinations you can bring - especially in smaller bass boats. In addition, while they minimize many of these locker issues, they do not eliminate them. Bent guides and broken tips are still symptoms of rod lockers with built in racks for organization. Enter Dave D'Allesandro, owner and founder of Stor's It. A little over a decade ago, Dave was having this very problem and had also lost patience with the limitations the rod racks in his locker were forcing him into. 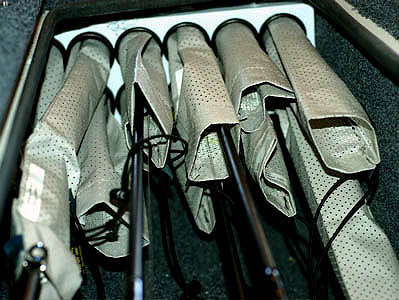 To cure this dilemma, Dave began making his own rod sleeves so that he could not only fit more rods in his locker, but do so safely and easily. One thing led to another and now, almost 12 years later, he's making and selling his product to tournament fisherman and recreational anglers throughout the country. The Field Tests: For our initial tests, we ordered 10 sleeves. After receiving our first 10 and trying them out in the rod locker of our Skeeter SX180, we quickly ordered 10 more so that we might test the full potential of this system. Storage: As you might imagine, filling up our 20 sleeves with varying combinations of rods was rather easy for us. 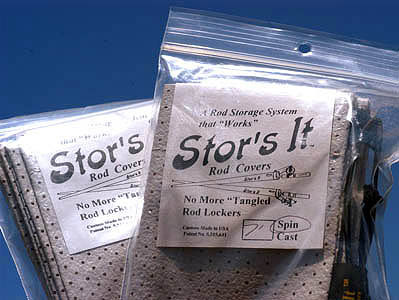 The Stor's It rod sleeves come in a variety of sizes to cover a wide rang of rods measuring from 5'6" to 7'6". Custom sizes are also available. We purchased mostly the models appropriate for 7' and 7'6" rods and went right to work filling them up and stacking them into our rod locker. As a word of caution, it's important to also use covers for your reels when taking advantage of this storage solution otherwise your reels will get scuffed during transport. Identification: We were quite pleased by the ease of which we could fill our locker with any number of combinations. Once we hit the water though, we quickly discovered one of the shortfalls of this system: identifying which combination is what. The rod sleeves are only available in one color and have no real way of for an angler to identify one from the other so other than looking at the handles of each rod, it's a little difficult to discern which combo is where when they're all stacked on top of one another. Fortunately, there's a very easy solution to this dilemma and that is employing the use of a label machine. Labels stick quite easily to the rod sleeves and are a great aid in organizing your gear with the sleeves. Effectiveness: As advertised, with our locker filled to the rim with rod and reel combinations, we were able to reach down to the bottom for a specific combo and pull it out through the stack of rods with little to no effort whatsoever. It is a truly amazing system in this regard. 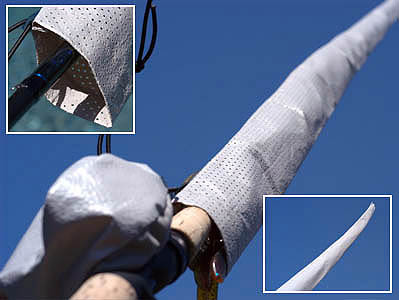 Unfortunately, this is a task that is best performed when at the dock or in a cove or other quiet spot on the water because one side effect these sleeves have is the ability to catch the wind. Pulling your sleeved combo's out of the locker in any amount of wind proves a challenging task once the rod is free because the wind can take hold of the sleeves rather readily. Once all the combo's you want for the day are out and free of the locker, laying comfortably on your casting deck, the next task is to find somewhere convenient to store the sleeves themselves. Naturally, we tossed ours back into the rod locker which was fine. When it came time to switch a combo out, however, we came to the realization we needed to wrap one combo back up before sticking it back into the locker, so we had to spend time sifting through the loose sleeves to find the proper cover for the combo going back into the locker. If you're an angler that changes combo's often, this can grow tiresome. 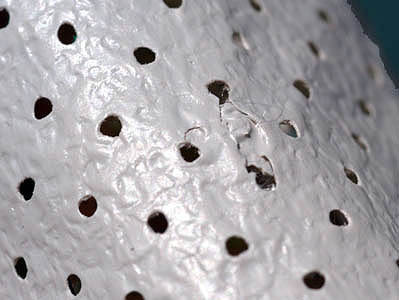 A close-up of the Stor's It sleeve material showing a spot where a hook on one of our pre-rigged rods came through the sleeve. Hardly noticeable, but there nonetheless. Durability: The sleeves themselves are made of a very durable vinyl material. Unfortunately, as with any material and especially one that is perforated, hooks can get caught up in the sleeves very easily so stowing pre-rigged combinations is not exactly convenient and may shorten the life of your sleeves. Otherwise, with proper care, we see no reason these sleeves shouldn't last through several years of use. 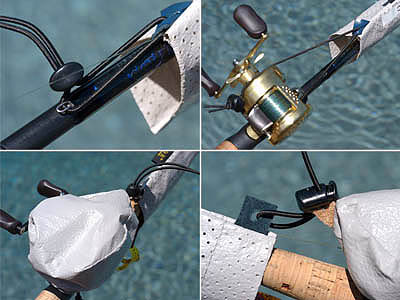 The Stor's It sleeves come complete with a strapping system to hook either your reel, a reel cover, or even the z-style hook keepers to stay in place. Convenience: As touched on earlier, the convenience of having any number of rod and reel combinations on the boat is one thing. The reality of switching between these combo's is a different matter entirely. We soon grew tired of the management overhead carrying over a dozen combinations of rods and reels on the boat at one time. For those who fish a set number of combo's on the deck and just need to be able to carry a few emergency spares in their locker while at the same time having a safe and convenient means by which to stow your relied upon set of rigs during transport, this could very well be an ideal solution. Preferring to spend as little time as possible after pulling back up out of the water before heading home, we found the extra ten to fifteen minutes necessary to properly stow our even a limited number of rods in their appropriate sleeves and get them all back into the locker a bit cumbersome. This is no fault of the sleeves, but simply a condition of the system itself. Other Uses: While we really appreciated the sturdiness of the Stor's It rod covers and truly admired their effectiveness, the management issues grew too cumbersome for us. Switching over to the standard rod rack system in our lockers, we ran into the problem of our guides catching the back end of the rod rack tubes and the additional issue of the rods becoming entangled with one another on the backside of the tubes. Taking our experience with the rod sleeves we came up with the hybrid solution of lining our rod rack tubes with our Stor's It rod sleeves and voila! Trouble free in and access of our combo's from the rod rack coupled with an easy way to manage the sleeves. It is truly the best of both worlds. While we still are not able to carry over twenty combinations thanks to the limitations of our rod rack, we no longer have to worry about banging guides and having our rods tangle on other side of the rack's rod tubes. The marriage of two systems. Our Stor's It Rod Sleeves tucked within a rod rack to mitigate against damaged guides and facilitate access. 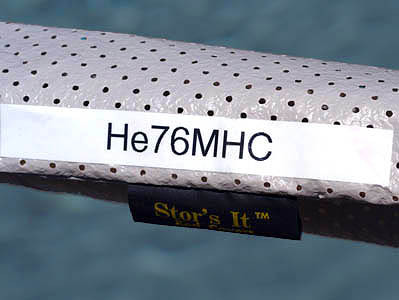 Availability & Accessories: The Stor's It rod sleeves are easily acquired through the company's website. Depending on stock, delivery is usually within the week. Dave and his wife Sharon take all the calls and answer all the emails themselves and are available to answer any questions you might have. If you don't already have covers for your reels, they make and sell those to work in conjunction with their rod sleeve system. 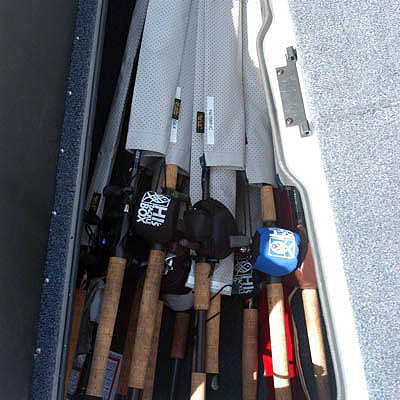 Conclusion: For those wanting to truly maximize the use of their rod lockers or for those with lockers that are relatively small and a rod rack doesn't make a lot of sense, there might not be a better solution out there for stowing your precious rods. For those with enough combo's to fill their lockers to the brim and more and even those with built in rod racks, but are experiencing issues form time to time, of rods getting tangled up or caught in the tubes, you owe it to yourself to look into these sleeves. The ease by which you can stack combo after combo into your locker, reach down to the bottom of the stack, and pull out the one you want to use right now is truly astonishing and reason enough to be awarded the TackleTour Innovation Award! But the fact that you can also use them as liners in your existing rod racks to mitigate against damaged guides puts these sleeves over the top. Until next time, look into these sleeves so you can keep collecting and have somewhere to stow all your gear!